The participants listened to the talk from Mr. Iiduka from Iiduka shop who have been engaging in carrying fish meal culture and Mr. Kikuchi from NPO Soma Green Ark, a fisherman and a shipowner in Soma-shi. 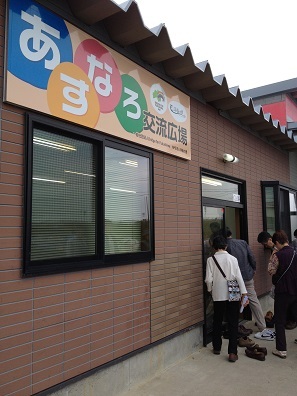 Mr Wakamatsu, manager of Wakamatsu Soy bean paste and soy sauce shop guided his soy bean pate storehouse in Kashima-shi. Ms. Kume, representative of NPO Ukifune no Sato took the participants to vacant town in Namie-machi, Odaka district after the residents evacuated. She also introduced them NPO’s new activity “Asunaro space”, which gave discussion opportunities among evacuees.